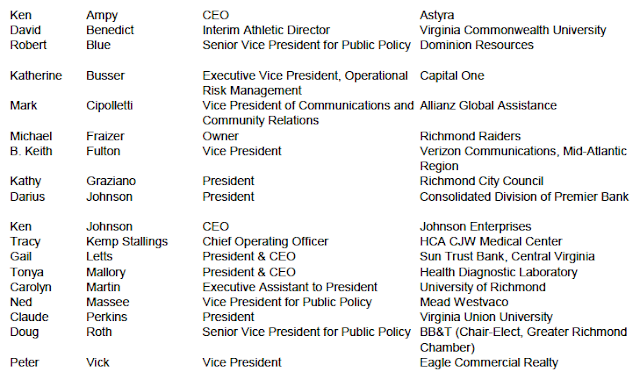 Mayor Dwight C. Jones today announced members of his Steering Committee to advise him on the opening of the Washington Redskins’ Summer Training Camp in the city of Richmond, beginning in 2013. The committee will look at the team’s criteria for a facility, existing state-of-the-art facilities, potential locations in the City, financing, and strategic partnerships. Technical expertise is expected to be provided to the committee through a variety of city and private sector resources. The Washington Redskins is the only national sports franchise based in Virginia, and the announcement that the Summer Training Camp would be moving to Richmond, Virginia, beginning in 2013, was made by Governor Bob McDonnell and Mayor Dwight Jones on June 6, 2012. On June 14, 2012, the City of Richmond successfully sold $248.2 million in bonds to include $101.3 million in continued funding for the City’s $500 million multi-year Capital Improvement Program (CIP). CIP projects include the construction of four new schools, a new Justice Center, street and sidewalk projects, and various other improvements to City buildings and infrastructure. In addition, $146.9 million of existing bonds will be refinanced at lower interest rates, producing $12.9 million in savings. The various series of bonds included $7.5 million of Qualified School Construction Bond proceeds issued at a net zero percent interest rate to finance a portion of the construction costs of the new Martin Luther King, Jr. Middle School. The nine firms of the underwriting team that sold the bonds was led by Citigroup, Wells Fargo and BB&T Capital Markets, and also included three minority-owned underwriting firms, Seibert Branford & Shank, Jackson Securities and M. R. Beal & Company. To achieve the above results, the City issued both a taxable and tax-exempt series of bonds. The City received an interest rate of 2.18% on its taxable refunding bond issuance of $100 million. Investor demand for the City’s taxable bonds was considerable. The City had orders for well over $200 million of taxable bonds. The longer term tax-exempt series received a 2.73% interest rate, which was roughly 1.50% below the City’s planning estimates. “These lower-than-expected rates are a benefit of the City’s strong credit rating, even at a time when many local governments are struggling to maintain their existing credit ratings. The City of Richmond has experienced several bond rating upgrades in the past few years,” stated Mayor Dwight C. Jones. All three of the national credit agencies, Moody’s Investor Service, Fitch Ratings, and Standard & Poor’s, rank Richmond in the “AA” investment grade category which is considered “very strong”. The City’s ratings are either one or two notches away from “AAA”, the highest possible credit rating. This fact, coupled with near historic low interest rates, provided the City the opportunity to achieve these excellent results.